The tremendous success of the Albatros Scouts in the early months of 1917 encouraged a feeling of complacency in the IdFlieg (Inspectorate of Flying Troops). It was felt that the Albatros Werke would continue to produce war winning fighters. However, by May 1917, such Allied types as the Spad, the Sopwith Pup, the Sopwith Triplane, and the S.E.5, were each able to outfly the Albatros D.III, and were appearing in greater numbers. It was then realized, with some dismay, that the new Albatros D.V was little better than its predecessor. The engine fitted to the D.V was the 180 hp (135 kW) Mercedes (the 160 hp (120 kW) Mercedes with an increased compression ratio). The 220 hp (165 kW) Mercedes and the 200 hp (150 kW) Benz were installed experimentally. The radiator was set in the top wing to starboard of the centre-line—machines operating in Palestine had two radiators. Wings, interplane struts and tail were identical to those of the D.III, but the D.V's aileron cables passed through the top wing and had small shrouds, while the D.III's cables ran through the lower wing and thence up to crank levers on the top wing. The prototype's rudder had a straight trailing-edge, but later machines had trailing-edges of rounded outline. The lower fin was taken back to the horizontal knife-edge of the fuselage—the D.III's lower fin terminated below the rudder-hinge line. In contrast to the flat-sided D.II fuselage, that of the D.V was oval in cross-section and deeper, so that there was a smaller gap between it and the top plane. A faired head-rest was fitted behind the cockpit, but it was frequently taken off. The undercarriage was of the steel tube type with a fairing over the axle, which provided extra lift. Twin synchronized guns were mounted. The D.Va differed from the D.V in having aileron cables as on the D.III. Its head-rest was generally removed to improve the pilot's view rearwards. The Jagtlstaffeln received the D.V in May 1917—the D.Va was supplied in the following month. From the beginning, fatal crashes caused by wing failure occurred and extra bracing wires were added to remedy wing flutter. In order to prevent the twisting of the single spar of the lower wing under stress, small struts were taken from the leading edge to the lower part of the interplane struts. Finally, the factory fitted a metal box-like sleeve to the center section of the lower wing—the sleeve enclosed the main spar and strengthened it. The aircraft manufacturers were ordered to modify those machines already issued, but subsequently an Albatross official visiting the front discovered that this work had not been done, and that wing failures were still occurring! Even after these alterations, pilots were advised not to dive too steeply, which hardly raised their morale. 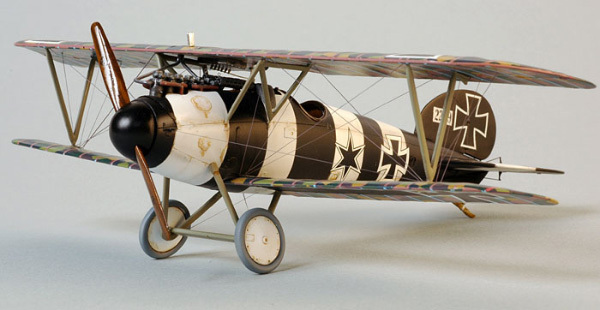 Nevertheless the type was used in large numbers, for the only alternatives were the suspect Fokker Triplane and the second-rate Pfalz D.III and many machines were still in operational use up to the time of the Armistice. The D.V/Va flew in Italy with German units, and operated in Palestine. Machines built by the Ostdeutsche Albatros Werke were designated Alb. D.V or D.Va (OAW). When the Albatros types were redesignated after the war (in order to circumvent the terms of the Armistice), the DV/Va was given the title L.24. One 180 hp (135 kW) Mercedes D.IIIa� 6-cylinder water-cooled inline engine. Two 7.92 mm (.312 in) LMG 08/15 machine guns. Created November 13, 2009. Updated May 21, 2015.